I-TAX (one Law one Software) is the software for filing Indian income tax returns forms [ITR-1 to ITR-8] easily from offline as well as online computers. The i-tax covers computation of income tax as well as the generation of ITR, either by the way of XML via e-filing or a printout via paper filing. Monarch Computers is a leading company driven by professionals with wide technical and domain expertise. The company provides most promising ecommerce software based on UI and web, for professionals. The company has served over 5000+ satisfied chartered accountants, account consultants and tax consultants with their flagship products such as income tax, accounting, auditor, value added tax, customer relationship management, etc. You can prepare computation from Asst Year 1995-1996 to Current year and Also Provisional Calculation for Next Asst. year. Direct Login and eReturn Submit in government website. 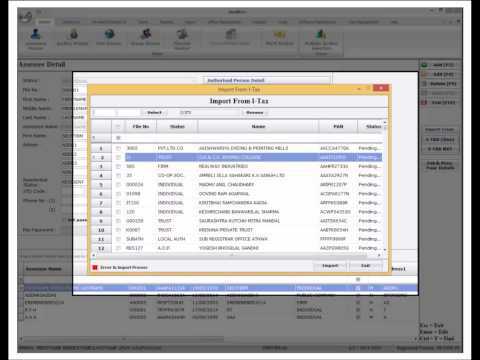 Data import facility in account statement and TDs and many more. Inbuild eTDS/eTCS and AIR software in ITAX. Parameter setting using to set I-TAX as per your requirement. Q. What I want to do if I Want to Print Company Details On Computation? Go to Main Menu in I-TAX Select option 9.Utilities > 3. Parameter Settings > 2. Statement P > Select Option 1. and Press "Y". Q. If there is Data Mismatch in Statement of Computation ? Then restart the I-TAX software again and Press "Z" or Go to Main Menu 9. Utilities > 1. Data Maintenance > 1. Index DataBase. Q. How to change Date and Time in I-TAX software? Set PC Current Date and Time and Contact us to create new PUK code to software in Single or Multi PC. Q. If download file not found for 2016-17 after due date? Then Select option ITR 12 and upload return. For Enable Notification in I-TAXGo to Action Center and Check never Notify and then Restart your PC.